Hello to all you Bad Kitties out there! Life has been crazy as usual. Now, my husband is back home for a while, and with the love of my existence back with me, I am super excited to get back in the kitchen!! After all, I am Scottish and Italian, so nothing says ‘I love you’ more than feeding someone. I think that is something I have learned over the last few months – food has to come from a place of love. The recipes have to be written with love, and created with intent… not just the intent of having something. There is a place for those recipes, but even they can be crafted with love. Yes, falling in love in five minutes is possible, just as anyone who has gone bar hopping in Tempe. Getting back to making carefully crafted comfort food has been fun. Now, I have a few recipes under my belt and I get to share those with you. 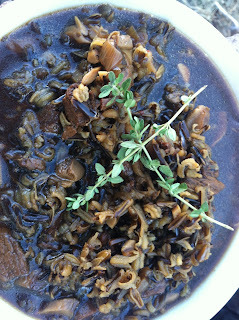 My lastest creation is a Wild Mushroom Soup. It has wild rice and beef seitan, with a salty broth, so all you really need is a hunk of bread to make this the perfect fall meal. Hopefully this will inspire you to get in the kitchen and get creative. Heat a soup pot over medium heat and add the onions. While waiting, dice the shitake and oyster mushrooms. Set all to the side. After the onions are caramelized, add the olive oil. Once the oil is hot add the oyster and shitake mushrooms, and cook until the start to reduce in size and turn golden. Add the garlic, cooking for an additional 30 seconds to 1 minute. Add the water, bouillon cubes, seitan, wild rice, bay leaves, and wild dried mushrooms (crumble them first if they are too large). Cover, bring to a simmer, and cook for 45 minutes until your rice is tender. Butternut Pear Soup with Recipe! !